Showing 1 - 9 of 9 Products for Air Intake Kit. 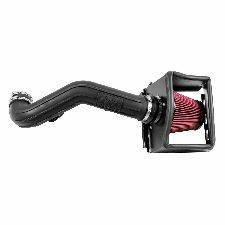 Enclosed cold air intake systems for diesel and gas pickups; gas motor homes. Streamlined components eliminate stock restrictions; flow more cool dense air for greater power and fuel economy. Air Filter Inside Diameter: 6.000 In. Air Filter Large End Diameter: 7.500 In. Air Filter Oulet Length: 1.000 In. Air Filter Oulet Width: 6.000 In. Air Filter Outside Diameter: 7.500 In. Air Filter Overall Height: 6.625 In. Air Filter Overall Length: 6.625 In. Air Filter Overall Width: 7.500 In. Air Filter Small End Diameter: 5.000 In. Intake Pipe Inlet Length: 2.000 In. Intake Pipe Inlet Width: 4.000 In. Intake Pipe Outlet Length: 2.000 In. Intake Pipe Outlet Width: 4.000 In. 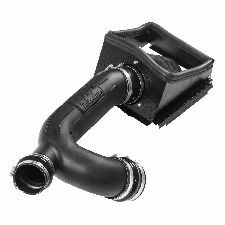 Take the performance of your vehicle to the next level with the addition of Flowmaster's new Delta Force Performance Air Intake system for 2017-2018 Ford F-150 truck with 3.5L Eco-boost engine. The Delta Force system contains an ultra-trick looking, custom molded black Cross-Linked Polyethylene (XLPE) high-flow intake tube, black anodized aluminum fittings (when applicable), high quality reinforced silicone couplers and all stainless steel hardware. Other features include a large 6" diameter high-flow conical shaped dry synthetic air filter, a custom-fit black powder-coated air dam with attachment brackets to securely mount the system in place along with soft bumpers to eliminate any metal to metal contact under the hood. For maximum performance and that iconic Flowmaster exhaust tone, we highly recommend pairing your new Delta Force Performance Air Intake with a Flowmaster exhaust system. Delta Force Performance Air Intakes are NOT currently legal for use or for sale in the State of California. Intake Pipe Inlet Width: 3.500 In. Intake Pipe Outlet Width: 3.500 In. 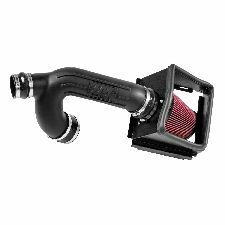 Take the performance of your vehicle to the next level with the addition of Flowmaster's new Delta Force Performance Air Intake system for 2015-2017 Ford F-150 truck with 5.0L engine. The Delta Force system contains an ultra-trick looking, custom molded black Cross-Linked Polyethylene (XLPE) high-flow intake tube, black anodized aluminum fittings (when applicable), high quality reinforced silicone couplers and all stainless steel hardware. Other features include a large diameter high-flow conical shaped 8 layer cotton gauze air filter, which traps more dirt than typical 6 layer designs, a custom-fit black powder-coated air dam with attachment brackets to securely mount the system in place along with soft bumpers to eliminate any metal to metal contact under the hood. The Delta Force Air Filters are serviceable with our new Delta Force cleaning kits which will help outlast your vehicle. For maximum performance and that iconic Flowmaster exhaust tone, we highly recommend pairing your new Delta Force Performance Air Intake with a Flowmaster exhaust system. Delta Force Performance Air Intakes are NOT currently legal for use or for sale in the State of California. Intake Pipe Inlet Width: 3.750 In. Intake Pipe Outlet Width: 3.750 In. 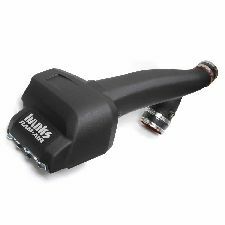 Take the performance of your vehicle to the next level with the addition of Flowmaster's new Delta Force Performance Air Intake system for 2011-2014 Ford F-150 Truck with 5.0L engine. The Delta Force system contains an ultra-trick looking, custom molded black Cross-Linked Polyethylene (XLPE) high-flow intake tube, black anodized aluminum fittings (when applicable), high quality reinforced silicone couplers and all stainless steel hardware. 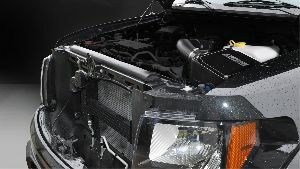 Other features include a large diameter high-flow conical shaped 8 layer cotton gauze air filter, which traps more dirt than typical 6 layer designs, a custom-fit black powder-coated air dam with attachment brackets to securely mount the system in place along with soft bumpers to eliminate any metal to metal contact under the hood. The Delta Force Air Filters are serviceable with our new Delta Force cleaning kits which will help outlast your vehicle. For maximum performance and that iconic Flowmaster exhaust tone, we highly recommend pairing your new Delta Force Performance Air Intake with a Flowmaster exhaust system. Delta Force Performance Air Intakes are NOT currently legal for use or for sale in the State of California. Air Filter Overall Height: 7.500 In. Air Filter Overall Length: 7.500 In. 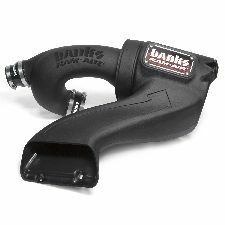 Intake Pipe Inlet Width: 4.070 In. 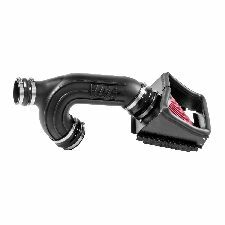 Take the performance of your vehicle to the next level with the addition of Flowmaster's new Delta Force Performance Air Intake system for 2012-2014 Ford F-150 truck with 3.5L Eco-boost engine. The Delta Force system contains an ultra-trick looking, custom molded black Cross-Linked Polyethylene (XLPE) high-flow intake tube, black anodized aluminum fittings (when applicable), high quality reinforced silicone couplers and all stainless steel hardware. Other features include a large diameter high-flow conical shaped 8 layer cotton gauze air filter, which traps more dirt than typical 6 layer designs, a custom-fit black powder-coated air dam with attachment brackets to securely mount the system in place along with soft bumpers to eliminate any metal to metal contact under the hood. The Delta Force Air Filters are serviceable with our new Delta Force cleaning kits which will help outlast your vehicle. For maximum performance and that iconic Flowmaster exhaust tone, we highly recommend pairing your new Delta Force Performance Air Intake with a Flowmaster exhaust system. Delta Force Performance Air Intakes are NOT currently legal for use or for sale in the State of California. 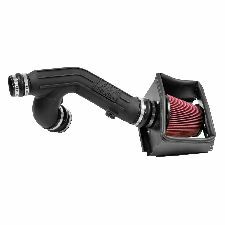 Take the performance of your vehicle to the next level with the addition of Flowmaster's new Delta Force Performance Air Intake system for 2017-2018 Ford F-150 truck with 3.5L Eco-boost engine. The Delta Force system contains an ultra-trick looking, custom molded black Cross-Linked Polyethylene (XLPE) high-flow intake tube, black anodized aluminum fittings (when applicable), high quality reinforced silicone couplers and all stainless steel hardware. Other features include a large diameter high-flow conical shaped 8 layer cotton gauze air filter, which traps more dirt than typical 6 layer designs, a custom-fit black powder-coated air dam with attachment brackets to securely mount the system in place along with soft bumpers to eliminate any metal to metal contact under the hood. The Delta Force Air Filters are serviceable with our new Delta Force cleaning kits which will help outlast your vehicle. For maximum performance and that iconic Flowmaster exhaust tone, we highly recommend pairing your new Delta Force Performance Air Intake with a Flowmaster exhaust system. Delta Force Performance Air Intakes are NOT currently legal for use or for sale in the State of California. Intake Pipe Inlet Width: 4.500 In. 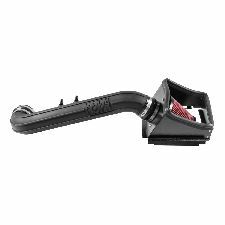 Take the performance of your vehicle to the next level with the addition of Flowmaster's new Delta Force Performance Air Intake system for 2015-2016 Ford F-150 with 3.5L ecoboost engine and 2015-2017 Ford F-150 with 2.7 ecoboost engine. The Delta Force system contains an ultra-trick looking, custom molded black Cross-Linked Polyethylene (XLPE) high-flow intake tube, black anodized aluminum fittings (when applicable), high quality reinforced silicone couplers and all stainless steel hardware. Other features include a large diameter high-flow conical shaped 8 layer cotton gauze air filter, which traps more dirt than typical 6 layer designs, a custom-fit black powder-coated air dam with attachment brackets to securely mount the system in place along with soft bumpers to eliminate any metal to metal contact under the hood. The Delta Force Air Filters are serviceable with our new Delta Force cleaning kits which will help outlast your vehicle. For maximum performance and that iconic Flowmaster exhaust tone, we highly recommend pairing your new Delta Force Performance Air Intake with a Flowmaster exhaust system. Delta Force Performance Air Intakes are NOT currently legal for use or for sale in the State of California.